Thoroughly mix the beef, stuffing, eggs, onion, ketchup and Worcestershire, if desired in a large bowl. Shape the beef mixture firmly into 2 (6 1/2 x 4-inch) loaves and place them into a 3-quart shallow baking pan. Bake at 350°F. for 1 hour or until the meatloaves are cooked through. Let the meatloaves stand for 10 minutes before slicing. 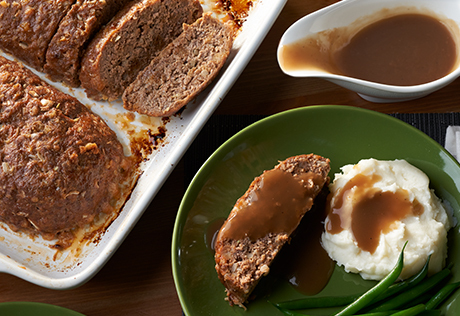 Heat the gravy in a 1-quart saucepan over medium heat and serve with the meatloaves.